Last week, Maude tried her hand at making giant origami. Isn’t is the coolest!? 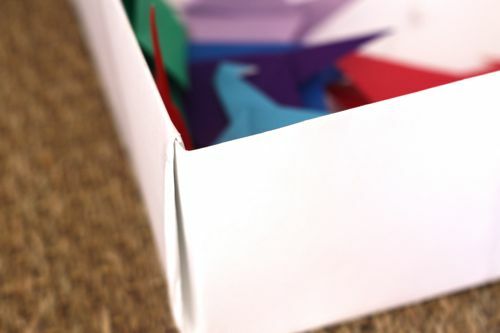 She made an origami box to hold her smaller paper cranes and she made a giant paper crane too! 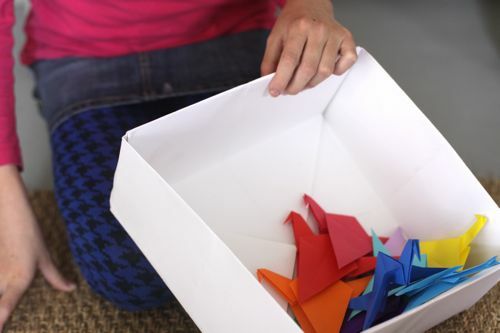 How neat would a whole flock of oversize paper cranes be at a party? Or in a bedroom? This is a GREAT idea!! 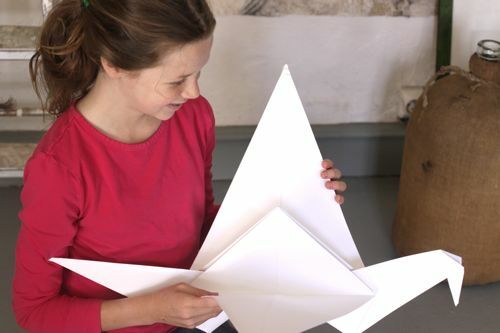 Using bigger paper might even make origami easier to fold for small children. Is that a bone folder your daughter is using? (That’s a good idea too). Thanks for sharing. Yes. Mimi is using a bone folder. The paper she used is a nice, heavy stock, so the bone folder was really helpful in making tight folds. Oh that looks so fun! I love origami. Did she have a great orgami book to follow? My six year is fascinated by all that is Japanese, so we have the paper, but the direction book is really hard for her (and me!) to follow. Any suggestions? thx!!! You should check out origami-club.com. I think it is the best origami resource! Click on the flag of Great Britain to see the website in English. This is so cool. I bet my DD would love to do something like this for her room. BTW, her houndstooth leggings are awesome! Have you seen Between the Folds? It’s a documentary about the art of oragami. Very interesting and unbelievable! Yes, highly recommended from our nest too! This film is absolutely amazing and inspirational. Thanks for sharing the link. Oh, I have to show this to my 10-year-old. She loves making paper cranes–especially teeny, tiny ones–and I know she’ll enjoy seeing Maude’s giant crane. Fun! That is just totally lovely!!! Do you know the Japanese legend of the crane? 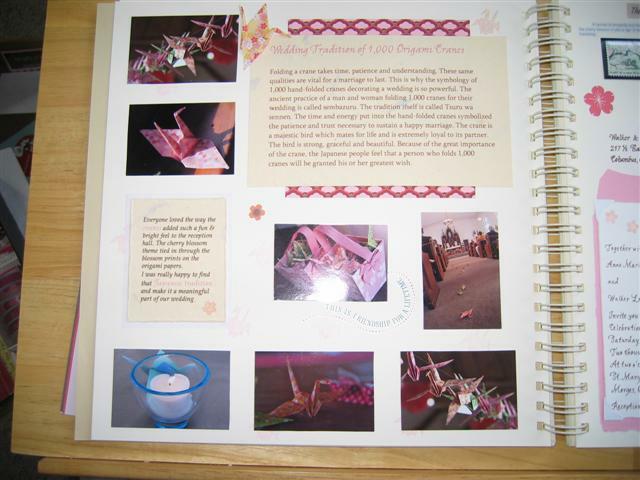 Check out the book “Sadako and the Thousand Paper Cranes”…..
Just beautiful. Masses of giant cranes would be lovely for a wedding! We saw it on the “Watch it Now” feature on Netflix. Yes please let us know how Mimi learned to do it on such a big scale, and what size paper she used? Very cool and inspiring! I love this idea! genius! I love this idea! 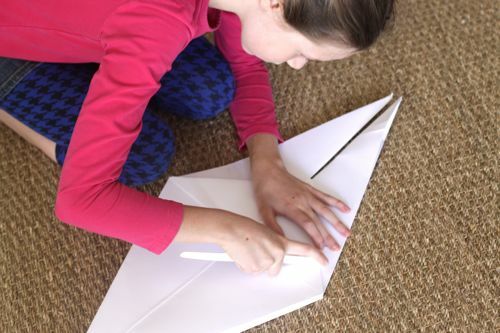 I remember making really tiny origami when I was a kid, but it seems much more fun to make giant origami! I adore that giant one! I made a whole flock of them for my classroom, and it looks AMAZING! The installation makes a huge statement. OH WOW! Don’t let my oldest see this. Last year when he learned how to make them lets just say I had a flock of them EVERYWHERE :) If he sees them this big I can only imagine although 1 really big one in my craft/playroom would be really cool! I made a origami crane mobile for my baby’s nursery. I used a fallen stick from the tree behind my house and ribbon to tie the cranes to the stick. Yeah, Maude! Bravo! Love you, Sweetie. What a beautiful results! What size paper did Maude use for the crane? I will be teaching my Year 4 students origami in the next few weeks as we are learning about how to write and follow procedures, and these would be EXCELLENT in my classroom (especially for my few students who have fine motor difficulties and would really struggle with the tiny versions). If you could let me know I’d really appreciate it! There are probably a hundred paper cranes hanging from the ceiling in the library at my kids’ school. The librarian’s daughter made them all! Last Christmas we decorated our church with white paper cranes. The entire front of the sanctuary was full of hanging cranes. Some were ginormous! It looked lovely and peaceful. Hours of folding by a team of people. It was one of my favorite holiday decoration themes we have ever had. Our friend made 2009 white origami cranes all by himself to propose to his chinese girlfriend, signifying they would marry in 2009. They used those cranes as decorations at their reception. Beautiful. I wanted to make a baby mobile of origami cranes but I am not talented. I bought one and sleep easily. If I had Maude’s talent I would try again! I made origami crane garland for my wedding and it turned out beautiful! here is a link if anyone would like to see. Those are so cute. I love the varying sizes. I think it would look great used on wall in a bedroom or as some type of mobile. O my I am fifteen and I am absoulutly in love with Maude outfit! But then again the Blairs are always an emensley fashionable group. My daughter (about the same age as Maude) made a similar giant crane a while back. 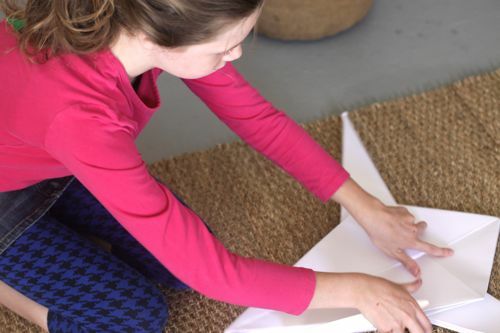 She learned origami on her own from books and websites and is happily obsessed. My son (5) has been obsessed with origami for much of the last year. He learned at a science night at the local elementary school to create 3d objects (like cubes, or more complex) out of simple flat folded shapes. We took some old architect’s vellum and trimmed it into 30″ squares, and made a cube with 10″ sides. He loves to follow the instructions in my books, and really likes Meenakshi Mukerjij’s books (http://www.origamee.net/).